Bloodied and beaten, the Restaurant Wars survivors gather to assess their situation. “I’ll never forget Restaurant Wars,” vows John, wiping a tear from his eye. “We failed on all levels. As people, as cooks, as chefs, it was a disaster.” Sheldon moans. “We all were just like, ‘we’ve got this,’ but we didn’t have it,” says Casey, dolefully. Katsuji says nothing, because he is gone. Off we go! To cheer up his old pals, Sheldon decides it’s time for a group beach trip. And conveniently, he has just the beach in mind! “After this crazy battle of Restaurant Wars, we need to get all this bad energy off of us,” he explains, as they bound into the cleansing Carolina waves. Who is that neck-tattooed gentleman waiting back at the kitchen? Why, it’s our good friend and season-six winner, Michael Voltaggio! Padma is delighted, which you can tell, because she’s wearing her mafioso picnic dress for the occasion. And now, together, they are going to explain the Quickfire Challenge: everybody will get five minutes to taste and identify a bunch of different ingredients, but the twist is that they have to do it blindfolded, because this is a reality-TV cooking show and this challenge always shows up eventually. 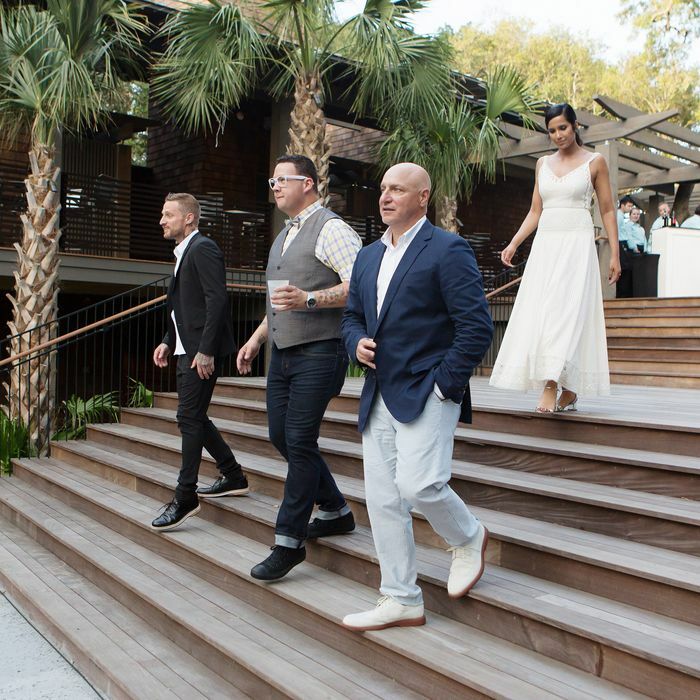 Michael Voltaggio warns them it is going to be very difficult, so obviously John isn’t worried. “I like this challenge,” he grins. “I have a really good palate.” Say what you will about John, but someday, I aspire to have his misplaced confidence. Brooke’s up first, and she identifies pretty much everything with remarkable precision, including a clam and John’s favorite ingredient, pimento cheese. It is almost as if this challenge isn’t that hard after all? Just kidding, it’s impossible. John, the James Joyce of Top Chefs, decides he’s going to take a “stream of consciousness approach,” which means he fails to correctly identify anything (“flour?” he guesses, tasting cream cheese). In the end, the final tally is: Emily guessed 5 out of 20 correctly, Sylva and Shirley each got 8, Sheldon had 10, 11 for Casey, and Brooke crushed everyone with a whopping 16 correct guesses. Brooke doesn’t win immunity, but she does win 14 cases of wine. Surprise! At Whole Foods, John races for the fish counter, because he’s making scampi. “Friday night was scampi night!” he beams. “We scampi’d everything that came out of the water!” Accordingly, he will be buying every piece of king crab in Whole Foods. “I’m definitely pissed,” says Sylva, who was hoping to make crab cakes. “Yee-haw!” says John, oblivious to the suffering around him. Luckily, Sylva has another, better idea, which is to make “Haitian beef bags,” which remind him of being a little kid during the holidays in Haiti. Sheldon will make chazuke, which is rice and tea, because his dad takes a thermos of tea to work every single day, and his family would use the leftovers to make rice. “He’s gonna laugh that I’m doing a dish based upon us not wasting tea!” chuckles Sheldon, before accidentally dumping a bag of barley on the floor. Brooke, who just spent a weird amount of time trying to make a joke about Sheldon’s pronunciation of “thermos,” is making crêpes stuffed with eggs Benedict, because “my son is my family” (he likes crêpes), and Emily is doing an interpretation of her grandpa’s icebox cake, because her grandpa used to make an icebox cake. But back in the kitchen, it isn’t long before Emily is having trouble with that very cake, because the ovens are uneven and the cake didn’t cook right. The bigger problem with Emily’s icebox cake, though, is that it is an icebox cake. “It seems super simple to me, for this $500-ticket event, but hey!” offers Sheldon, charitably. “Maybe Emily’s got a winner!” Maybe! After a quick night’s sleep at the ranch, the chefs load up the wagons and set off for Kiawah Island! Brooke is anxious, because she has not made her crêpes yet. “It’s okay,” Sylva reassures her. “I still haven’t stuffed my lollipop balls.” No one has any idea what he is talking about, but apparently Sylva’s beef patties are now going to be beef lollipops, because he wants to remind the guests “about the child inside of them.” Deep down, the thing that Sylva actually wants is to impress his dad, who still doesn’t understand why he struggled for so long so his son could grow up to become the help. 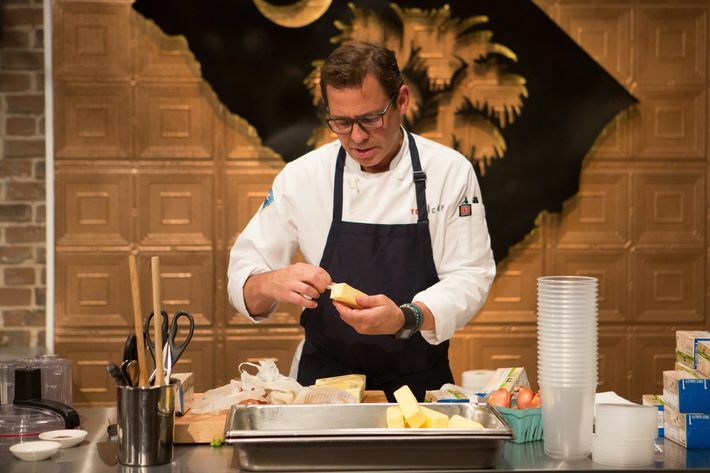 “My big plan is to win Top Chef and show him that being a chef is an amazing thing,” Sylva says, which is moving, but also a lot of pressure to put on a lollipop ball. “This is the kind of house that Denzel would have right here!” exclaims Sheldon as the chefs roll up to the poolside party site. “This house is no joke!” Also no joke: the heat, which is melting Sylva’s beef-pops. Emily is still fighting with her icebox cake, which hasn’t soaked up enough coffee liqueur, and also kind of has a third-grade-bake-sale vibe. Emily’s not worried, though, because she’s just going to “mush it together” into a ring mold. Yum! And so the gala begins! Immediately, it’s clear we’re off to a strong start, because Michael Voltaggio demands everyone do shots first. Tom and human teddy bear Graham Elliot are both taken with John’s butter-poached crab with garlic foam, because it transports them to the shores of Long Island. “This is really good,” decrees Tom. “And the foam made sense.” Truly, the highest praise of all. Tom says Brooke’s ricotta and egg-yolk crêpe is “about as decadent as a breakfast can be” and Graham says it’s “a testament.” Michael wishes Casey’s crab macaron with citrus marmalade and pea shoots had just a pinch more salt, but he’ll live, somehow. Shirley’s Beijing-spiced lamb leg is good, except for the fact that you need a sabre to eat it. Everyone gushes over Sheldon’s snapper with roasted barley tea and rice, and Tom says Sylva’s Island beef lollipop with turmeric and potato is triumph and he should start a beef-lollipop restaurant. In the end, the top three chefs of the night are Sylva, for his mind-blowing meat-pop; Brooke, for her crêpes Benedict; and Sheldon, for the tea-soaked rice. With unsettling intensity, Michael Voltaggio does the honors: The trophy goes to Sylva! “Uh, wow,” he offers, startled as ever by victory. Now for the losers! It’s between Casey, Shirley, and Emily. (John, who neither won nor lost, is off to the side reveling in his mediocrity.) Casey’s macaron was the most appropriate for the occasion, if only it’d had just one more flake of sea salt. Shirley’s lamb was perfectly tasty, except that it wasn’t possible to eat it, and Emily’s cake would have been unobjectionable, if she were at a family picnic. We have all known what is coming, and now the moment is here: Emily is off. It is the end of an era, in a way. She held on for so long! And so we are down to a single newbie, which makes me somewhat question the very premise of this competition. Next week: grab your lifejackets, ‘cause we’re all going boating! Top Chef Recap: What’s Your Favorite Childhood Memory?